The pot was a Collared Urn, with a very distinctive, heavy collar. The pot was large, at approximately 210mm high, and was decorated with a variety of techniques, including an incised lattice pattern on the collar, and an incised zig zag pattern on the shoulder of the pot. The top of the rim had been decorated with regular circular impressions. These circular impressions were also made on a portion of the body of the pot too. The incised decoration appears to have been made by a very sharp tool, perhaps a thin piece of flint. The circular impressions were possibly made with a sharpened twig, although close study of the impressions show that the tool was slightly irregular, and may have been twisted as the impression was made. The pot is quite unusual in that it has a section of impressed circular decoration on the collar and shoulder of the pot. This doesn’t continue around the whole pot, unlike other prehistoric pots which tend to be decorated in a regular fashion around the whole pot, meaning it looks the same from whichever angle you look at it. This Perhaps the Wilton Moor pot had a ‘right’ side and a ‘wrong’ side and was designed to be seen from a particular direction. 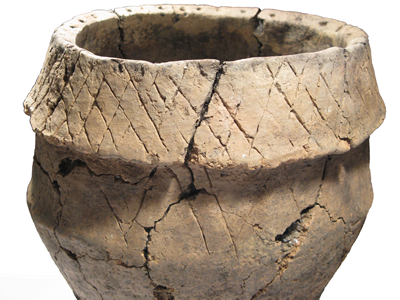 As with lots of prehistoric pots, however, this pot isn’t perfect. It appears that the potter did not plan out the decoration properly, as the zig zag decoration on the shoulder overlaps at one point. This pot is still, however, a very good example of a Collared Urn. Vyner, B. 1991. Bronze Age activity on the Eston Hills, Cleveland’ Yorkshire Archaeological Journal 63 25-49. The pot from Wilton Moor is held by Tees Archaeology.